A nearly uninterrupted expanse of forest teeming with snow-capped volcanoes, trails, and wild rivers makes Northern California’s Shasta Cascade region an unparalleled hub for outdoor adventure. The area encompasses 20 percent of the state’s land mass but has less than 2 percent of the population—meaning you can experience the national and state parks, wilderness areas, rivers, and woodlands without the crowds. Redding, California, makes the ideal jumping-off point to explore the region, providing easy access to the outdoors so you can enjoy what Mother Nature has to offer. Likewise, getting to Redding couldn’t be any easier, as I-5 runs right through the city and it’s just three hours from San Francisco and two hours from the California-Oregon border. Here’s a glimpse of some UpState CA gems within 90 minutes of downtown Redding, much of it under-the-radar, close to the city, and far from the crowds. You don’t have to go far to find some spectacular parks and recreation areas that are excellent options for hiking, climbing, fishing, and biking. Explore the area’s natural wonders at these gems that are within a short drive of Redding. 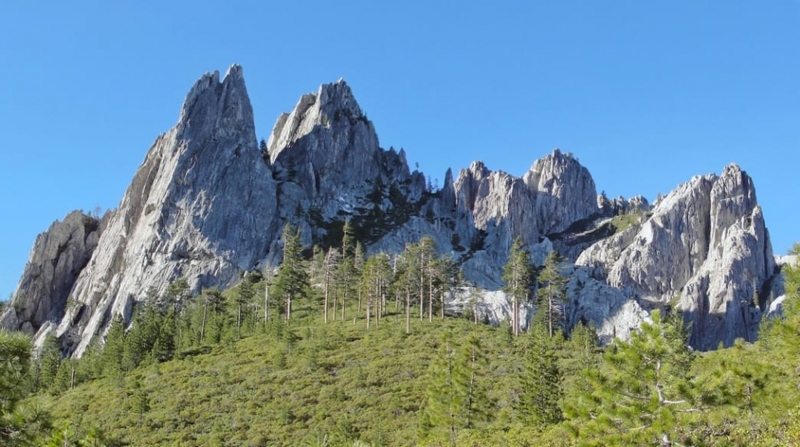 Less than an hour north of Redding on I-5 you’ll find what could be the most underrated state park in California: Castle Crags. Named for the dramatic granite spires and domes that reach up to 6,000 feet, this park has 28 miles of trails along with several access points to the mighty Sacramento River. The crags offer up sprawling views of Mt. Shasta and the surrounding peaks along with technical rock climbing opportunities in a pristine setting. For even more of an adventure, hikers can enter the 10,500-acre Castle Crags Wilderness adjacent to the state park. 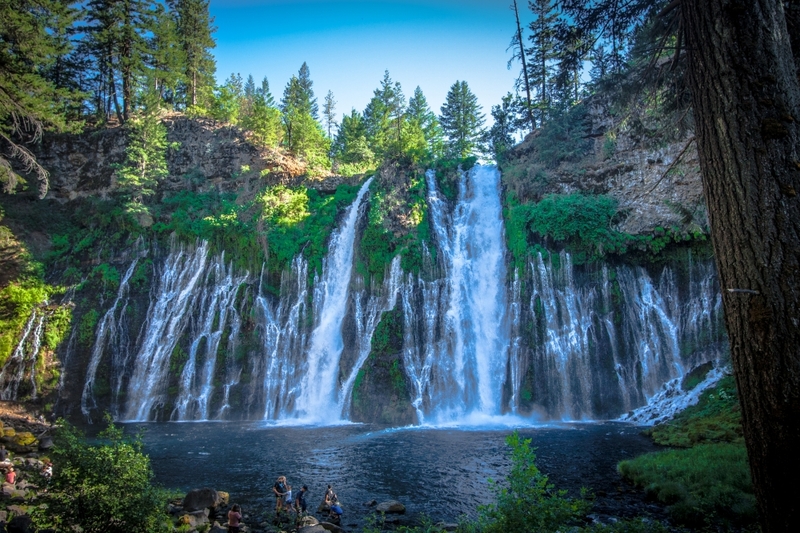 The 129-foot Burney Falls may be one of the most recognized attractions near Redding. Several trails lead to picture-perfect vistas of this 129-foot misty waterfall, while a few other hikes traverse along Burney Creek and the evergreen forest surrounding it. The park, located 65 miles northeast of Redding, also encompasses Lake Britton, a small lake ideal for paddling and boating with the family. A few miles east of Burney Falls, Ahjumawi Lava Springs State Park protects an extremely rugged wilderness for the intrepid traveler to explore. Accessible only by boat, most of the area is covered by recent lava flows, leaving behind jagged black basalt right along the water. Once you’ve reached the park from the boat launch on Big Lake, you’ll have your pick of 20 miles of hiking trails to explore this beautifully bizarre landscape. The clear waters of Lake Shasta, just 20 miles north of Redding, hold an intriguing secret: a network of natural limestone caves accessible from the shore. 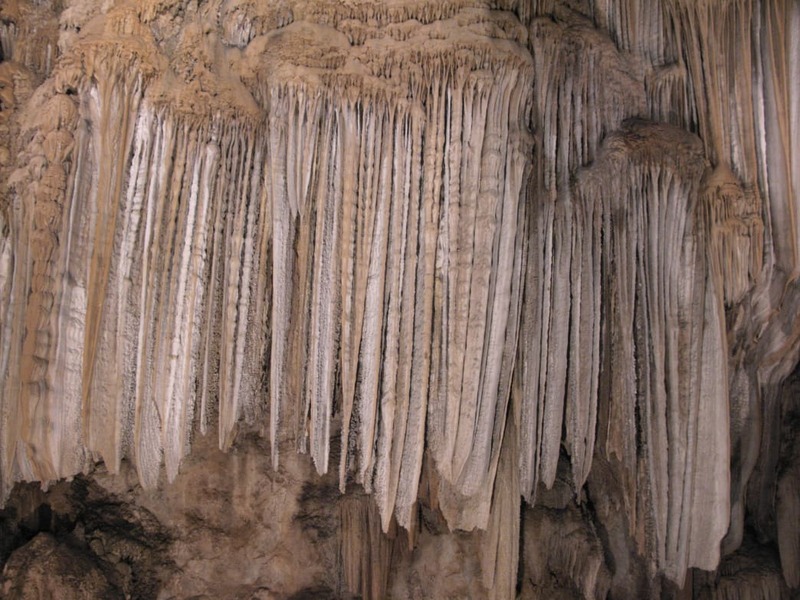 Daily tours take you across the lake by boat and into the lighted caverns to fully experience their entrancing features—rounded stalagmites, multi-colored layers and shimmering minerals lining the walls and ceilings. From pristine lakes to thundering whitewater, the region around Redding has something for everyone. The picturesque setting draws visitors from across the country to enjoy boating, rafting, kayaking, and fishing. Take to the waters for an unforgettable experience. 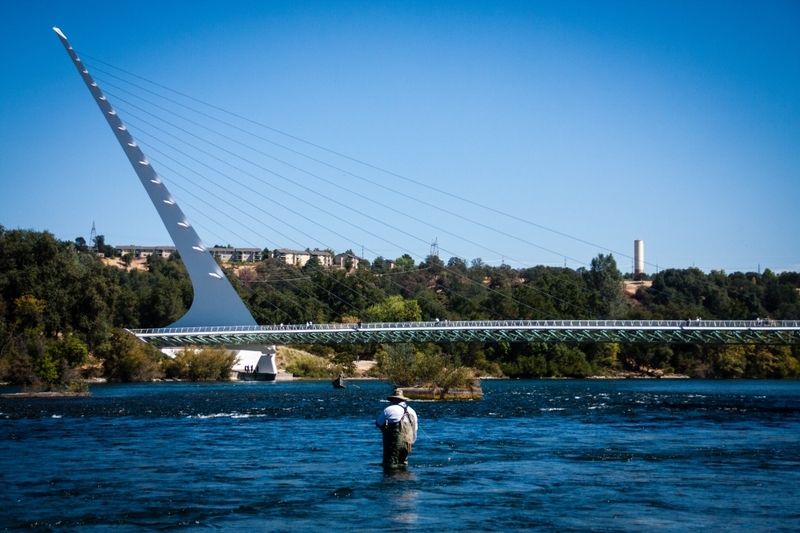 Northern California is home to some of the best fly fishing found anywhere in the country, and the Redding area hosts an impressive portion of those prized rivers and streams. The Fall River, in particular, earns its reputation as the mecca for fly fishing in the Shasta-Cascade region. This spring-fed waterway makes a crystal-clear rainbow trout habitat, which can be fished from the end of April to mid-November. Other nearby fisheries like the McCloud, Trinity, Lower Sacramento, and Klamath Rivers boast equally impressive wild populations of rainbows, browns, steelheads, and salmon. Stop at The Fly Shop in Redding for up-to-date fishing information and all the bait and tackle you could possibly need. You’ll also find local guides who can show you a thing or two on their home waterways. Redding is a definitive hotspot for whitewater rafting and kayaking on some of the West’s wildest and most beautiful rivers, with six local outfitters offering guided trips. The Sacramento River flows directly through Redding and has numerous sections of whitewater up to class III, along with gentle stretches for a relaxing float. 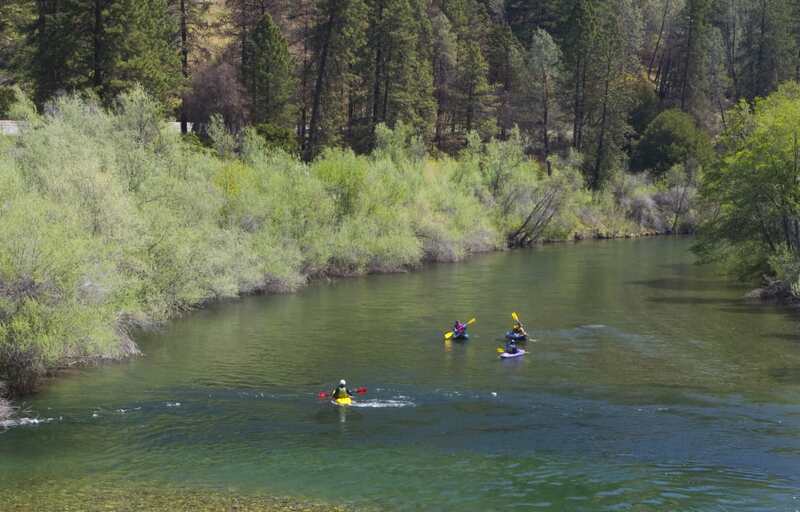 Another local favorite, the Trinity River, has rafting opportunities ranging from class II to V.
The nationally recognized Wild & Scenic sections of the Klamath River north of Redding feature excellent whitewater in an unspoiled natural setting. For those wanting an even more remote experience with a hardy dose of adrenaline, the Salmon River three hours northwest of Redding challenges experienced whitewater kayakers and rafters with class V rapids in the depths of a pristine canyon. Ready to explore something you don’t see every day? 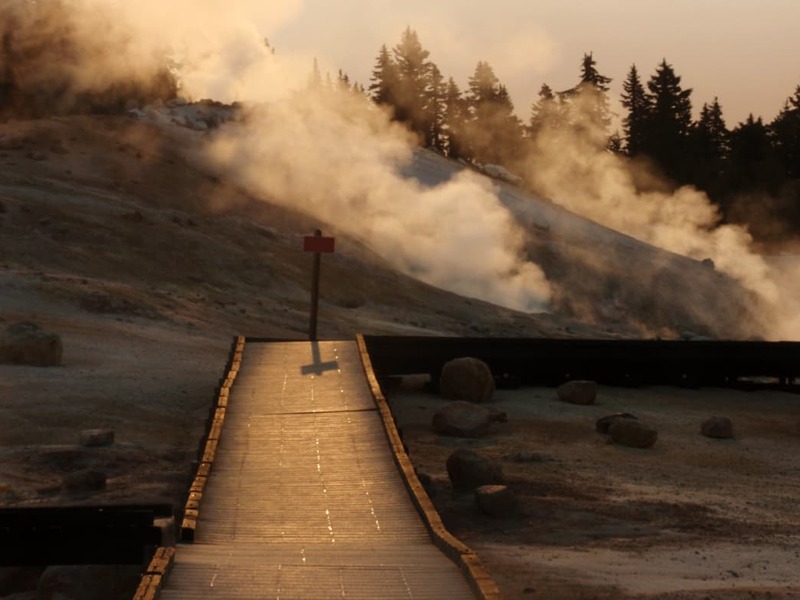 Northern California remains a hotbed of hydrothermal activity, and there are several options to see this unique environment. Forty-five miles east of Redding you’ll encounter the wild juxtaposition of lush and desolate landscapes housed in Lassen Volcanic National Park. The 10,500-foot Lassen Peak, a semi-dormant volcano, marks the centerpiece of this diverse environment. The park’s 150 miles of hiking trails explore bubbling hydrothermal areas, meadows, lakes, and numerous volcanoes. Many of the park facilities and roads close when snow blankets this high-altitude zone come winter, making summer and fall the best time to visit. The Shasta-Cascade region of California is part of a string of volcanic activity that runs through the Cascade Mountain Range of the Pacific Northwest, making it an ideal place to experience this unique geology. The Volcanic Legacy Scenic Byway connects Lassen Volcanic National Park to Crater Lake National Park in southern Oregon, passing through more natural points of interest like Lava Beds National Monument and Tulelake National Wildlife Refuge along the way. Spanning a total of 120 miles, the scenic byway is one of only 42 All-American Roads in the U.S. and is ideal for driving June through October. So whether you want to explore this region by car, foot, bike, or boat, you can’t go wrong—Redding is the perfect home base for a memorable getaway.